How has the Innovative Learning Hub expanded opportunities for Hilliard students? The Hub is an expansion of our Innovation Campus and provides additional space for strategic programming to strengthen student engagement and depth of knowledge for grades 6-12. It allows students to have more choice in their school day. Some of the areas we have grown include adding a Visual Arts Academy as part of our Imagination Network—a program that includes courses in Art and Ecology, and Motion Graphics and Animation. We grew and centralized a Newcomer’s Center called ELite – English Learners Unite, for students new to our country and district. Hundreds of middle school students also join us each day as part of a new program called Core Infusion, and we have increased enrollment and capacity for our College JumpStart Network as well! This purposeful choice in offerings directly aligns to student interests and skills needed in the workplace. The expanded Innovation Campus has enabled more students to capitalize on unique offerings to personalize their learning experience. As a result of increased enrollment on the Innovation Campus, the district has been able to delay discussion of an additional high school or middle school. The Hub has enabled more students to personalize their learning experience. How does the design support Hilliard’s “Ready for Tomorrow” initiative? A significant component of our initiative was to cultivate a 21st century learner with strong emphasis on creativity, innovation, critical thinking, problem solving, collaboration and communication. The new design directly aligns to these characteristics by promoting flexibility and movement, and it is purposeful with our emphasis on design thinking. 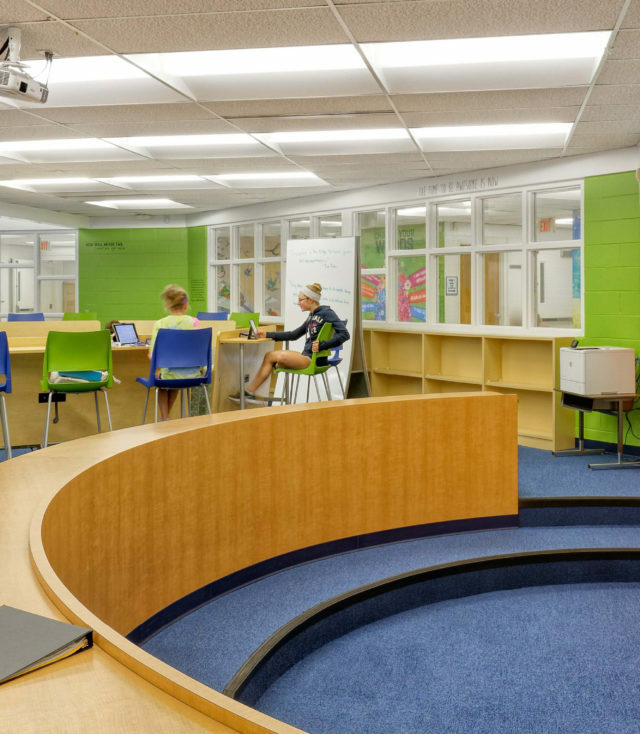 The design of this learning environment allows us to focus on producing students who are active and self-directed. To achieve this, multiple modes of student learning are supported. The Hub features spaces for individual and group work, as well as for formal and informal learning. Students can interact, explore and present, promoting a sense of community within the space. The design is a perfect blend that supports students in being architects of their learning journey. The design of The Hub promotes flexibility and movement for multiple modes of student learning. 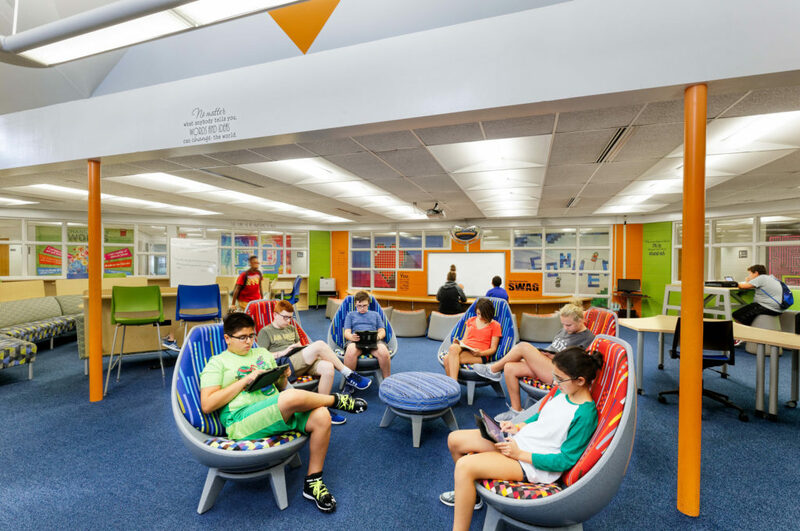 What are the students’ favorite spaces and why? The students are enjoying all aspects of The Hub! They particularly love The Union with its amazing furniture and color! It is the central meeting space for large groups and the focal point of the building. Collaboration, laughter and deep learning come out of this space daily. The cafeteria, AKA the Greasy Wheel, is also an awesome space to grab lunch, a snack or to integrate large groups for collaborative learning. The flexibility of this space is amazing, as we find students working independently in a booth or in large groups. The Greasy Wheel recently hosted an integrated (MS Core Infusion and HS ELite Newcomers) Innovation Gallery Walk and invited other students and adults to join in this authentic learning opportunity. 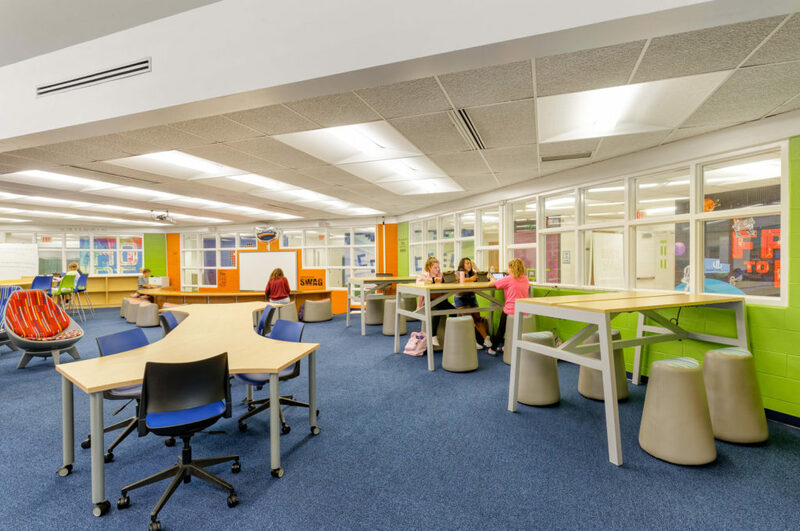 The Collaboration Studios in each wing have also proven to be among the students’ favorite spaces with agile furniture and space to build and create! The ruckus chairs and desks that elevate are fan favorites, too!